"The Sitar is a world in itself, extensive, limitless, with towering peaks and deep valleys. 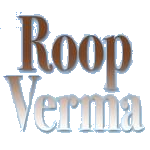 Roop Verma is an explorer and pioneer of this musical planet. His ascent to the zenith of music and his plumbing of the silences - these ventures are not to be missed. The spiritual heart of India can be felt in his musical outpourings. Nowhere is this pulse perceived more clearly and more beautifully than in Roop's music. Roop Verma conveys, in both solo and ensemble performances, the soul of India and in so doing, this virtuoso performer enables the listener to reach the heights within." "You read about concerts that are spiritual but they are rare. Roop Verma's concert was one of them". "Roop's emergence from India's rich cultural leagacy has become a compelling voice in the international music scene." "The music of Roop Verma takes us back into ourselves and leads us to discover the breathless depths of dreams, of beauty, the peaceful power, the unbroken faith, the dazzling wonder of bliss that we already possess."